Getting a tattoo seems like a good idea for you to express yourself through body art. However, there is a significant percentage of people who regret having tattoos later and are considering different ways on how to get tattoos removed. It is a mix of bad and good news to have a tattoo removed. The bad news is that a tattoo is meant to be permanent. Therefore, most of the common de-inking methods will not work. The degree of success depends on the skin color, size, and pigmentation of the tattoo. On the other hand, the good news is that you can now have it removed with new laser technology. Before getting a tattoo removed, here are some useful tips you should keep in mind. These tips are suggested by Proesce, a laser skin clinic in Adelaide. There are three common types of laser technologies used in getting tattoos removed. They include the Q-switched ruby laser (694 nm), alexandrite lasers (755 nm), and Q-switched Nd: YAG laser 532 nm 1064 nm). The alexandrite and Q-switched ruby lasers are used for the removal of blue, black, and green pigments. Conversely, the Q-switched Nd: YAG laser (532 nm) removes red pigments while the 1064 nm Nd-YAG laser takes out the blue and black coloring. Research has shown that Picosure tattoo removal laser technology is one of the best lasers to remove unwanted coloring. This type of laser equipment uses short bursts of energy to remove moles, tattoos, age spots, and acne scars by delivering the energy in pulses of a trillionth of a second (called picoseconds). The piece of equipment is effective in removing stubborn tattoo colors. Your choice of the tattoo-removing machine depends on the colors of the tattoo image you need to eliminate. Some laser tattoo removers combine two or three of these laser technologies. Moreover, each tattoo removing laser machine has different energy levels that are adjusted according to the stubbornness of the image and skin reaction. Laser technology uses pulses of energy that are delivered in the form of a high-intensity light beam. This high-intensity beam may damage your eyes. Therefore, the tattoo remover will give you a pair of protective eye shields. You will have to wear them always when getting tattoos removed. 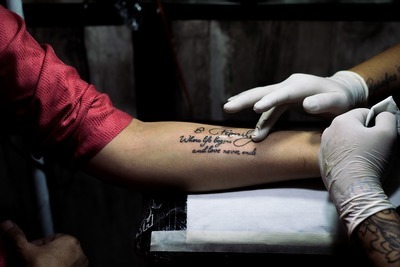 When getting a tattoo removed, the technician is being responsible for ensuring that there are no oils, dirt, or any other substance that can impede the process from being carried out. Therefore, he or she will clean the tattoo and wipe it dry with a clean towel before progressing with the rest of the steps. The technician then tests small pulses of the high-intensity light on the tattoo to ascertain the optimum energy level to use on it. Your level of discomfort and the absorption rate of the light will determine the best wavelength to use for the procedure. Once the technician is satisfied that your skin can handle a given energy level, he or she will commence with the tattoo removal process. The light is passed to the top layers of your skin at the location of the tattoo to avoid damaging the rest of the surface. You may need to visit the technician several times before the tattoo is completely removed. With each visit, your tattoo gets lighter. The visits required depending on the toughness of the colors that were used and the size of the tattoo. It may feel a little uncomfortable during a tattoo removal session. However, most people do well without anesthesia. If the tattoo is in a sensitive location, you may have to apply a topical anesthesia cream at the start of the procedure. After each procedure, use an ice pack to soothe the treated part. Apply some antibiotic ointment too and bandage the area. A week after the session, remember to keep the burns moistened and soothed with aloe vera gel. Make sure to stay out of the sun. You should keep the area covered with clothing or wraps when going outside. If sun exposure is unavoidable, make sure you apply sunscreen.